As a guitarist compression can either be your best friend or your worst enemy. Adding a compressor pedal to your board can squash your sound and remove all dynamics in your playing or add sustain and character. 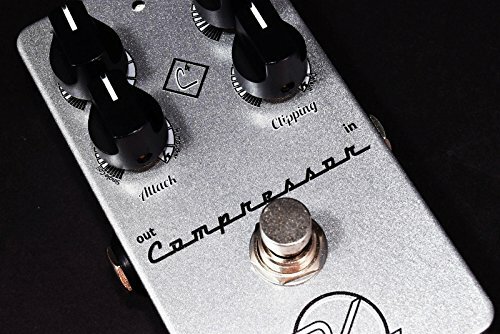 Compressor pedals works by making the loudest sounds quieter so it can increase the overall volume of the source sound and make it more consistent. Not every compressor pedal works the same though, some will add warmth or grit while others will remain clean and transparent. Some compressor pedals will have very short attack and release times, while others will allow you to modify every characteristic with the turn of a knob. Let’s take a look at some of the best compressor pedals available in 2017. The MXR Dyna Comp pedal is one of the most popular compressors of all time and it comes at a very affordable price. This pedal is simple to use with two controls output and sensitivity. With output controlling the overall gain and sensitivity essentially controlling the amount of compression or sustain. In my experience this pedal is really good at doing a super squashed sound. A little warmer sounding than the Boss compressors at their default setting although it lacks a tone control. This pedal is noticeably less noisy than the Boss compressors, which is a large reason it makes the list. Don’t be fooled by this pedal’s small size. It has a big sound and is loaded with controls and options for tone. What really sets this pedal apart is it’s blend knob. This allows you to blend in some of your original uncompressed sound, often referred to as Parallel Compression. This means you can get a really squashy compressed sound without losing all your dynamics. It’s really useful for getting the character you want from a compressor while still being able to dig in and get a little more dirt just with your pick! Their are three controls on the top for Volume, Blend, and a three-way Lo/Mid/Hi compression level. However, inside the pedal their are four more controls for Attack, Release, Lo Pass Filter, and High Pass Filter. This is a really great pedal and it doesn’t eat up too much of your pedalboard real estate. The Keeley Four Knob Compressor Pedal is held in very high regard with most guitar player. Some people call it the best compressor pedal in the world! What really sets this pedal above other compressors is it’s quality of sound. Something kind of hard to explain but this pedal just sounds better. The Keeley Compressor is made with higher quality components than other pedals and that is what really sets it apart. The four knobs on the legendary Four Knob are Sustain, Level, Attack, and Clipping. The clipping control limits the input of your guitar before it hits the compressor. The Attack control on this pedal actually controls the recovery time, which makes it function more like a release control. All around a classic pedal that stands the test of time as one of the best compressors out there. There you have it compressors, some of my personal favorite pedals because they are both subtle and extremely useful. These are the secret weapons to a truly great tone. Thanks for reading, see you next time!